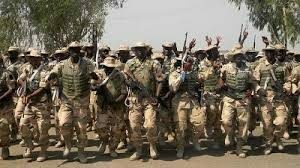 By Sadiq Umar – President Muhammadu Buhari on Saturday charged military personnel deployed to Katsina State to combat the menace of armed bandits in Zamfara, to be `as ruthless as humanly possible’, telling them not to spare any cattle rustler or armed robber, in carrying out the assignment. Mr. Buhari gave the charge while speaking to the joint military force at the Umaru Musa Yar’Adua International Airport Katsina. The president expressed satisfaction with the efforts of the military so far in combating violent crime in the area. Challenging the 1000-strong military force, he said: “I do not want you to spare any cattle rustler, armed robber or any bad element who thinks he is above the law. Already, the Nigerian Air Force (NAF) has deployed fighter aircraft to Katsina, the airport with the closest proximity to Zamfara, to allow for immediate and effective response to the menace of the bandits. ‘‘Nigerians are looking up to you and us to secure the country. What is happening in the areas of operations is disgraceful,” the president said. Adding: “I’m very pleased with the way officers and men are firmly putting it down and I want you to be as ruthless as humanly possible. Nigerians deserve some peace. “When we came into government, what we promised was security. The country has to be secured to be managed. ‘‘A lot of them did not have the opportunity to be educated to secure respective jobs; their expectations are very high,” Mr. Buhari told the troops.